PHOENIX - Sam Hornish, Jr. made history, and a great first impression with his new team Sunday by earning his first career Indy Racing League victory on the one-mile oval at Phoenix International Raceway before a crowd estimated at around 15,000 strong. The 21-year-old driver piloted his Dallara-Oldsmobile to a win in the Pennzoil Copper World Indy 200 in his debut with the Pennzoil Panther Team after leading 140 of the 200 laps. In doing so, he becomes the youngest driver in IRL history to take the checkered flag. Hornish, Jr. had a couple of near misses in the race including scraping the wall while trying to avoid lap traffic, and making contact with reigning IRL champion Buddy Lazier while exiting the pits. "We had a couple of close calls out there, but overall it went smooth. This is a great opportunity for me. This team is well funded. It is good to know I will get to run all of the races," said Hornish, Jr., who won for the first time in his nine IRL starts. Lazier, who finished third behind Hornish and Eliseo Salazar, fought with mechanical problems near the end of the race. "It was a hard day. It was a dog fight but we had a great car out there. Our only problem was breaking fifth and sixth gear," said Lazier, whose Dallara-Oldsmobile bounced off the rev-limiter endlessly in the final few laps with no higher than fourth gear. CART champion Gil de Ferran had been running consistent speeds in sixth place, saving fuel, through the first 76 laps before the Team Penske driver was hammered from behind by Jeret Shroeder while slowing down to enter the pits while leading. Shroeder, apparently not realizing de Ferran's intentions, pulled in behind him after coming off Turn 4 and slammed into his back end, sending both cars into the outside wall. Mark Dismore, meanwhile, was running eighth behind the pair and got caught up in the wreckage as all three crashed heavily, though they all walked away from the incident. Shroeder, de Ferran and Dismore up against the wall. Unfortunately, the IRL, now in its 6th year, still plays to mostly empty grandstands. "There has been some criticism directed at PDM Racing driver Jeret Schroeder about the incident in Turn four...The Indy Racing League officials made it very clear in this morning's drivers' meeting that no driver entering the pits should leave any doubt as to their intentions. Jeret was not aware that de Ferran was entering the pits," said PDM Racing owner Paul Diatlovich. Team Penske teammate Helio Castroneves started from the 17th position and was running second behind Hornish when he ran into engine trouble and had to retire on Lap 142. Blown engines were the story of the day with numerous drivers retiring from the race with expired powerplants. One of those was polesitter Greg Ray, whose string of bad luck at the Phoenix oval continued Sunday. The Team Menard driver has won three-straight poles here but has finished no better than 11th. "It's really disappointing. We had a great car in the race but about 20-25 laps before it finally let go, it just kept on getting slower and slower," said Ray, who won the IRL title in 1999. While a number of rookie drivers were making their debuts on the Phoenix oval, former Beverly Hills 90210 star Jason Priestley made his first appearance in the IRL broadcast booth. He joins veteran ABC broadcasters Bob Jenkins and Larry Rice, as well as pit reporters Jack Arute and Vince Welch in covering the 13 events this season, including the 85th Indianapolis 500 on May 27. The Indy Racing Northern Lights Series now takes a three-week break before resuming with the Infiniti Grand Prix of Miami on April 8. Because of conflicting schedules, the Penske CART drivers won't be back on the IRL starting grid until the Indianapolis 500. Joining them will be Chip Ganassi drivers Bruno Junqueira and Nicolas Minassian and Team Motorola's Michael Andretti, though the latter entry hasn't been confirmed yet. 1. 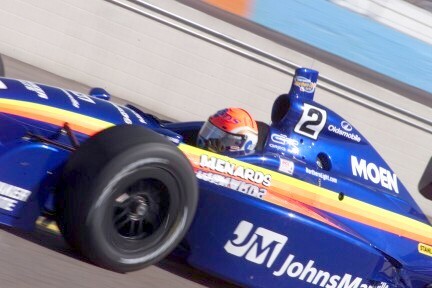 (2) Sam Hornish Jr., Dallara-Oldsmobile, 200, $124,300; 2. (13) Eliseo Salazar, Dallara-Oldsmobile, 200, $89,650; 3. (6) Buddy Lazier, Dallara-Oldsmobile, 200, $67,650; 4. (10) Scott Sharp, Dallara-Oldsmobile, 200, $55,600; 5. (7) Billy Boat, Dallara-Oldsmobile, 200, $51,150; 6. (9) Felipe Giaffone, G Force-Oldsmobile, 199, $45,950; 7. (3) Jeff Ward, G Force-Oldsmobile, 199, $44,350; 8. (16) Robby McGehee, Dallara-Oldsmobile, 198, $43,350; 9. (11) Buzz Calkins, Dallara-Oldsmobile, 197, $43,100; 10. (18) Airton Dare , G Force-Oldsmobile, 197, $42,100. 11. (8) Robbie Buhl, G Force-Infiniti, 196, $46,000; 12. (20) Davey Hamilton, Dallara-Oldsmobile, 192, $39,900; 13. (24) Shigeaki Hattori, G Force-Oldsmobile, 192, $16,900; 14. (26) Brandon Erwin, G Force-Oldsmobile, 185, $15,800; 15. (19) Tyce Carlson, Dallara-Oldsmobile, 162, mechanical, $36,800; 16. (14) Stan Wattles, Dallara-Oldsmobile, 157, accident, $35,800; 17. (21) Sarah Fisher, Dallara-Oldsmobile, 145, engine, $12,600; 18. (17) Helio Castroneves, Dallara-Oldsmobile, 142, engine, $34,600; 19. (12) Eddie Cheever Jr., Dallara-Infiniti, 133, throttle, $33,600; 20. (25) Casey Mears, G Force-Oldsmobile, 133, electrical, $10,600. 21. (4) Stephan Gregoire, Dallara-Oldsmobile, 131, accident, $34,600; 22. (1) Greg Ray, Dallara-Oldsmobile, 121, engine, $55,100; 23. (23) Al Unser Jr., G Force-Oldsmobile, 104, engine, $10,600; 24. (5) Gil de Ferran, Dallara-Oldsmobile, 76, accident, $32,600; 25. (15) Mark Dismore, Dallara-Oldsmobile, 75, accident, $32,600; 26. (22) Jeret Schroeder, Dallara-Oldsmobile, 74, accident, $10,600; 27. (27) Didier Andre, G Force-Oldsmobile, 53, handling, $10,600. Winner's average speed: 125.072 mph. Margin of victory: 1.3786 sec. Cautions: 5 for 37 laps. Lap leaders: Hornish 1-67, Ray 68-73, de Ferran 74-76, Castroneves 77-80, Sharp 81, Ray 82-118, Gregoire 119-127, Hornish 128-200. Standings (after 1 of 13 races): Hornish 52 points, Salazar 40, Lazier 35, Sharp 32, Boat 30, Giaffone 28, Ward 26, McGehee 24, Calkins 22, Dare 20. RON GREEN: Joining us in the track side press conference room is the winner of the Pennzoil Copper World Indy 200, Sam Hornish Jr., and co-owner John Barnes. First let's get some comments from Sam. SAM HORNISH JR.: I'd just like to thank all the guys at the Pennzoil Panther Racing team. They did a great job putting a good car to me today. I could drive anywhere I wanted on the track. Speedway gave me the power I need to get passed these guys. They made my job easy. We had a couple close calls today, but it was on our side. RON GREEN: Get some comments from John. JOHN BARNES: What can I top after that? Two hours of nail biting and sitting on our seats and watching him do a great job. RON GREEN: Sam Hornish Jr. earned his first Indy Racing League victory in his ninth start. Hornish made eight starts in 2000 with PDM Racing. Let's throw it open for questions. Bruce? Q: I think I asked you Friday the same question. You had the necessary tools to win with and it didn't take you long to prove that you did. Talk a little bit about the opportunity you've got. SAM HORNISH JR.: It's a great opportunity. I'm with a well-funded team that's going to get me to all the races, and all I have to do is go out there, be patient, maintain my cool and just, you know, get in the car, bring it home, and that's all I did today is I tried to go out there, push the car just to where I knew it would finish and made it look pretty easy, and it felt pretty easy for me. The car was perfect all day long. Q: Question for you, John. What a young kid to be sitting there in Victory Lane. How do you go out and find a 21-year-old that has a 35-year-old racer inside? JOHN BARNES: I don't know about that. As you know, we tested a lot of people and we went to look for a new driver for this year here, and he outshined everybody, so I think we knew going in after our test at Kentucky that he was the guy and that he was going to step forward and he was going to wear yellow this year. RON GREEN: At 21, Sam is the youngest winner in Indy Racing League history. More questions? Bruce? Q: What was it about him at PDM last year that really impressed you? Seemed to be a guy that you could do a lot with what he had to work with. JOHN BARNES: Well, I think first off, you guys downplay PDM a lot. I think they are a great team. I think they really do a lot with what they have. They are always competitive. And I mean we just looked at the thing and saw -- we know what we wanted. Andy Brown is our chief engineer, and he had goals and, you know, an outline of what he wanted in a driver, and we had Pancho Carter involved in that actually since Indianapolis on. He was involved with helping us find a guy to replace Scott (Goodyear), who had huge shoes to fill. Sam did, in coming here, because I think Scott's done a great job for us, and we won our last race last year, and we carried it on to this year here. Sam's done a great job for us in testing so far this year and, you know, it's just on to the Phoenix race. Q: Sam, what was the track like out there? Did it change at all throughout the race? SAM HORNISH JR.: It changed twice during the day. I think it changed about Lap 40. It started loosening up a little bit, getting a little bit greasy, and it changed about Lap 180 from my perspective because I started feeling every push that the car made. So, you know, I think the car just, you know, loosened up a little bit. The track, did, too, because some of the other cars starting coming back to me. I wasn't having to put as much effort into it to pass. I think the track got greasy twice today. It just progressively went a little bit more -- you know, that's what you get when you pick up the afternoon heat. Q: Did you just drive through it or did you guys make changes on the car, John, to adjust to the track? JOHN BARNES: We did one half a front wing change. That's all in one day. Q: Sam, the only time I saw you have kind of have competition, if you will, was from Castroneves on a couple restarts. Did you have any other time when you felt like you had some pressure, and then talk about that time with Helio behind you. SAM HORNISH JR.: I'll start with the time when Helio was behind me. I knew that I had a little bit better car than he did in traffic and that he wasn't really -- he wasn't able to put the car on the high side as well as I was able to. So I wasn't really worried about it. I knew as long as I was in front of him and I didn't let him get underneath me, that he wasn't going to be able to go around me on the high side. The only other time I felt some real competition was Eliseo started catching up to me before the last yellow flag and he gained some time on me until we got in traffic. I think that's where my car was the best today was working through traffic and I was able to put it anywhere where a lot of guys weren't able to go on the high side. Q: Sam, can you just talk about last year? You didn't know from race to race whether you were going to have a ride or the money to go on racing and now you got a whole test program and just your frame of mind coming into a race weekend. SAM HORNISH JR.: Well, my mind-set overall is a little bit better this year based on a little bit of experience knowing what I need to be thinking about, what I need to do when I'm out on the track. But also knowing that you're going to every race is a great confidence builder. And knowing that you have the money there that if you wreck a car or two, that's not the end of the world and it's not going to put you out for the end of the season, although we don't like to do that. But it just makes my job a lot easier and it gives me a lot more confidence and more -- and even being the Pennzoil driver, it gives me a lot more confidence in my ability. RON GREEN: Before Sam's win today, the previous youngest winner in the series was Buzz Calkins, who won it at 24 in the inaugural Indy Racing League event in Walt Disney World. Q: John, a lot of times change of scenery could be good for a driver or a team. Did you kind of feel like you needed a gasser like to see how good your cars really worked? JOHN BARNES: Well, I think all along we've known how competitive our equipment's been, and I don't mean that braggadocio. It's just the people that we have there at Panther with A.D. Brown and the people at Speedway Engines and, of course, the people at Dallara. I think they have done a great job this year and they did last year. You know, the change of scenery, like I said, you know, Scott drove for us since '98. He did a great job for us and it was just time for a change, you know. And I also want to thank Firestone tires. I think they had a great tire here today and we had absolutely no trouble with it whatsoever. It's just amazing. We ran -- you know, basically ran the car out of fuel twice, and the tires, we took them off, they looked like brand new. RON GREEN: More questions for Sam? Over here. Q: Are you surprised you found success so quickly? A lot of guys are out there, spend a lot of years trying to get to this level. A lot of guys still haven't gotten to that point, and all of a sudden, here you have a few races last year, you get a real solid field together, boom. Are you surprised with yourself? SAM HORNISH JR.: I'm surprised that I got to Victory Lane as soon as I did. I was -- you know, pretty much went in with the mind-set today to try to get in the top three. But as far as getting to where I'm at at this point in my career, I think, you know, I'm not really surprised at myself. I'm just really thankful to have parents that were willing to do whatever they could to get me to the next level and to keep moving me on and progressing to the next level and, you know, the time when they weren't able to help me anymore was the time I got picked up and got a ride. So I have to give some thanks to God for knowing when enough was enough of their help. Q: Last year at Kentucky when you really burst upon everybody's consciousness here, you were out there running like a Tasmanian devil. How big of a hard break was it when the car broke? That was probably your best race up to this point. SAM HORNISH JR.: It wasn't really a heart break. When we went into that race, we didn't know we were even going to race until the Wednesday before, so it was just kind of one of those deals where I was really happy to be there and then to go out. We knew that we had a motor that had a lot of miles on it. We didn't have the capability, you know, to get a fresh motor, so we just -- I pretty much knew when I started the race I had to get to the front as quickly as I could and just hope that I was leading if the thing blew up. Luckily it didn't blow up. I ran out of fuel. We had a little bit of a problem with a pit stop. That's how things go and I passed the pace car coming out. We went a lap down. It wasn't really a letdown. It was just kind of the turning point in my career and made me happy to even be there. Q: Also, Penske -- Helio Castroneves came from deep in the field to lead the race. What is both of your impressions of their first time effort here in the IRL? SAM HORNISH JR.: I knew that they were going to be really competitive. I actually thought they were sandbagging a little bit through practice and everything, because they have a lot of talent, great engineers, and a lot of money to throw at it and with the combination of the three, you still need, you know, a little bit of luck on your side. But I knew that they were going to be competitive and it wasn't really a surprise to me to see them up there. JOHN BARNES: Well, I say the same thing. I think Roger's got a great team. I don't care what he races in. I know at one time before the race, he stopped by and he said that Jeremy Mayfield was running fourth and Wallace was running 10th in the Winston Cup team. His two CART teams and CART drivers, they are always competitive. They are a great group of guys and I think that, you know, they are going to be competitive when they race against us at Indy. RON GREEN: More questions? Thank you very much. Both John and Sam will be available for a few few one-on-ones.